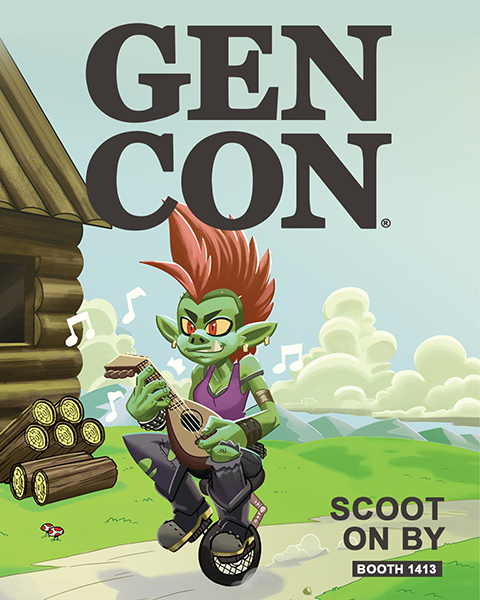 Daily Illuminator: SJ Games Heading To Gen Con August 2-5! July 26, 2018: SJ Games Heading To Gen Con August 2-5! What a great week! Now that we've launched The Fantasy Trip on Kickstarter, we can sit back and enjoy the summer . . . Wait . . . Gen Con is WHEN?! NEXT WEEK?!?! Good thing we're prepared! The SJ Games team is locked and loaded, ready for the best four days in gaming. Booth 1413 will be jam-packed with demos of our new and upcoming games, like the Munchkin Collectible Card Game, The Fantasy Trip, and of course Munchkin. We'll also have promos, as well as our infamous card machine, potentially doling out signed Munchkin CCG loot! Not only that, but we'll have John Kovalic signing at the booth, on Friday at 2 p.m. and Saturday at 4 p.m. That's a lot of stuff! And that's only one section! We also have our Organized Play area, where we'll be running our ticketed events, like the Munchcathlon, Super Kitty Bug Slap and Munchkin CCG learn-to-plays, and even the Munchkin CCG National Championship! Our MIBs will be hanging out teaching games with us, so make sure to get tickets now, or bring your generics. Our retail partners, Adventure Retail, will have a ton of new releases on sale at the show, including Munchkin Fowl Play, Munchkin Side Quests, Triplanetary, Munchkin Starfinder, and more! Pick up some new loot, and make sure to pay with exact change . . .
John Kovalic (Munchkin . . . just about everything) Thursday, August 2, 7-8 p.m.
Eric M. Lang (Munchkin CCG) Friday, August 3, 7-8 p.m.
Lar DeSouza (Super Munchkin Guest Artist Edition, Munchkin CCG) Friday, August 3, 7-8 p.m.
Howard Tayler (Munchkin Starfinder) Saturday, August 4, 7-8 p.m.
And make sure you are there Thursday night for a big, top-secret Munchkin announcement. You won't want to miss this one. Make time to see us at booth 1413, and check out all of our events and Tavern this year. See you in Indy!